People spend most of their life time, usually 20 to 40 years, making money because money is playing an important role in everyone’s life. Few people can live without it. If there was a machine that could make money 24 hours a day, 7 days a week, then it could free themselves from being trapped in a working life for 20 to 40 years. Wonderful, right? In this post, we are going to talk about how to construct a passive money making machine that can generate money out of thin air 24/7 effortlessly. We will examine its building blocks and then study in detail its elegant design and weaknesses. This machine depends on Forex, Foreign Exchange, which is the largest financial market in the world. Normally, people only deal with forex when they want to travel to other countries. They need the foreign currency to do shopping abroad. However, there some people who trade Forex as a day trader to make money by buying and selling currencies frequently. Well, this is not an ideal way of making money because it requires too much effort which defies the purpose of writing this post. The machine that we are going to build does not need much of human intervention. It runs on full automation. Forex involves the trading of commodity called currency. Currency is also called money which is the thing that we work hard to earn. Each country issues its own currency. The major currencies are USD (US Dollar), EUR (Euro), GBP (Sterling Pound), AUD (Australian Dollar), NZD (New Zealand Dollar), CAD (Canadian Dollar), JPY (Japanese Yen) and CHF (Swiss Franc). These eight currencies are the major currencies because they are being traded the most while other currencies are called minor currencies or exotic currencies because they are being traded less. Each currency has a certain yield which is being determined by the central bank of its country. The yield is the interest rate set by the country. If we hold the currency in the bank, we earn certain amount of yield due to the interest rate. For example, Malaysia has an interest rate of 3 %. If we save RM 100 in fixed deposit in the bank, we earn RM 3 at the end of the year due to the interest rate. These currencies are the basic building blocks of this money making machine. The data is coming from OANDA historical interest rate. The first column is the currency. The second column is the bid column which shows the yield that we get if we hold the currency. The third column is the ask column which shows the yield that we need to pay if we sell the currency. The last column is the date of the yields being effective. They might get updated from time to time. In order to build an optimal money making machine, we need the high yield currencies. Some of the interesting currencies are INR (Indian Rupee), TRY (Turkish Lira) and ZAR (South African Rand) where each has a yield of 3.5750 %, 6.2000 % and 4.7000 % respectively. Each trade in Forex is done through a pair of currencies. You sell currency X in order to buy currency Y. You trade at least two currencies at the same time every time. So, for example, in order to profit from the high yield currency, you trade EUR/TRY by selling/shorting it (selling EUR and buying TRY) to get an effective yield of 6.2 – 0.4 = 5.8 % (6.2 % bid for TRY and 0.4 % ask for EUR). Well, you might say “What is so special about these high yield currencies?” They are still less than 6 % after all where you can find better investments elsewhere that have equal or higher return easily. The key to getting higher return from these high yield currencies lies in the secret weapon (of mass destruction) offered in the Forex market called leverage. In the case of Oanda, a Forex broker that I have been with for almost 10 years, they offer 50:1 leverage for majors currency pairs and 20:1 for exotic currency pairs. Since INR, TRY and ZAR are all exotic currencies, the maximum leverage you could use is 20 to 1. Let say you have $ 100 in you account, you could trade at most 100 x 20 = $ 2000. With a yield of 5.8 %, you could earn $ 116 per year with a $ 2000 trade on selling EUR/TRY (which means holding TRY). That’s a 116 % annual return on an account with $ 100. However, using the maximum leverage means that nothing could go wrong with EUR or TRY which means EUR does not appreciate or TRY does not depreciate, else you will lose half of what you have in your account based on Oanda’s margin requirement before margin closeout. For example, using the above chart as an illustration, if you used maximum leverage which means you used 100 % of your available margin to open a position at Oanda, it only took EUR/TRY to move 2.43 % up (which is the opposite direction of your position) to induce a margin closeout in your account where you would lose half of your account balance. The risk is too high. We are not living in a perfect world, so we need to allow some (bigger) margin of error if EUR/TRY moved in the wrong direction. Therefore, we only use part of the leverage. But how much margin of error should we allow for our position? Based on historical data, the rate of a currency pair seldom moves more than 20 % a year, so a 20 % price movement is a reasonable price movement range. So from the above chart, we only need around 18 % of our available margin in order to allow for 20 % price movement in the wrong direction. Not only that, using 18 % of the margin could generate a return on investment of around 20 % per year. That’s wonderful. I haven’t mentioned that the account used for trading can actually be based in AUD which has the highest yield among to offered account currencies at Oanda (USD, GBP, EUR, AUD, SGD, JPY, CAD, HKD, CHF). So the interest earned each day (the interest is paid daily) from the EUR/TRY position is being compounded with the yield from the account currency AUD which is at a rate of 1.64 %. This means the total return from the investment is slightly greater than the indicated 20 %. It is actually compounding daily. Update 30 April 2015: Received announcement from Oanda this morning that Oanda will no longer pay interest to the account balance due to administrative overhead to manage interest payments in near or below zero interest rate environment. Therefore, the 1.64 % interest for the account balance that I mentioned above is no longer valid. However, the 5.8 % interest payment on the currency pairs held in position will continue to be paid or charged. So we have designed a self-growing machine via interest rate. It is so simple and elegant that no work is required to maintain it while it works ceaselessly generating income for you. Can we get better than that? No matter how good a design, it has its limitations. First, interest rate is something that is controlled and set by its own government. Government could raise it or reduce it at anytime without prior notification. The functioning of the machine is highly dependent on the interest rates set by their countries. Second, there are plenty of black swans living in our world full of uncertainties. Events where the rate of a currency pair moves 10 or 20 % in a day is not rare at all like what happened here and here. Think about the limitation of the design that led to the Fukushima Daiichi nuclear disaster. The nuclear plant’s seawall at Fukushima was designed at 10 metres high thinking that was enough to handle any future incidents of tsunami. However, what happened on 11 March 2011 resulted in a nuclear meltdown of three of the plant’s six nuclear reactors because the seawall was just a few metres short of the tsunami. So in this case, the seawall’s height is analogous to the price movement range that we set in our machine. Anything greater than that will be a disaster. Here is an experiment with a real account running for more than half year with this money making machine. The initial balance is AUD 310 on 11 September 2014 and the latest balance is AUD 364 on 23 April 2015. That is a return on investment of 17 % over 7 months. The balance is being converted to RM for comparison. As you can see, the exchange rate is quite choppy. As an engineer, I like building machines. It is even more fun building machines that make money. What do you think? Disclaimer: Forex trading is a highly leveraged and risky activity. People might lose all their money in Forex due to reckless behavior or unforeseeable events called “black swan” so try it at your own risk. This entry was posted in Investment and tagged Currency, Finance on April 26, 2015 by Chok Leong. Since mid-March 2014, the Euro has been depreciating steadily against Ringgit. There is no sign for the down trend to stop. According to news that I could find, the Europe need a lower currency to boost its economy, especially for its export driven growth. “A weaker Euro for a stronger Europe” as the news goes. Over 6-month period, the EUR/MYR has dropped from its high of 4.57356 till current low of 4.10920, a total of 10.15% drop. 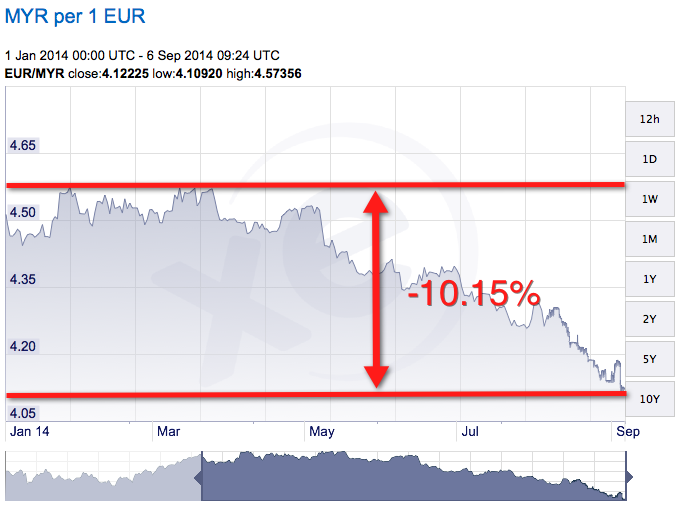 It is quite a significant drop for a strong currency like Euro. I still have part of my saving in Euro. So I feel the impact. Euro won’t be able to gain strength anytime soon. Given a clear trend like this, it should be a good opportunity to take advantage of by shorting the Euro. I need to hedge the Euro as an insurance to protect my saving in case the Euro continues to depreciate. This is the time to put my Forex account into use. Let day dream a bit: using a Forex account with 1 to 50 leverage margin and a starting balance of RM 100, you can sell RM 5000 (Initial Balance x Leverage = RM 100 x 50) worth of units in the currency pair that you trade. If the currency pair dropped 10%, it means you earned RM 500 (RM 5000 x 10%). That’s a 500% (Return / Initial Balance x 100% = RM 500 / RM 100 x 100%) return on investment! The good thing is, it is scalable. You can increase the initial balance to RM 1000 or more and generate even more cash. Ha, this is only possible in dream and it always seem easy but in fact it is not if you ever tried. This entry was posted in Research and tagged Currency on September 7, 2014 by Chok Leong.